It was warm and quiet out in the pasture, we fed the sheep and donkeys and then walked out back in the paddock with them. Suzy, one of our easiest and gentles ewes sat down next to Maria, she clearly wanted some back scratching, which Maria often provides her. Red was a good distance away and Fate came over to lie down next to Maria also. 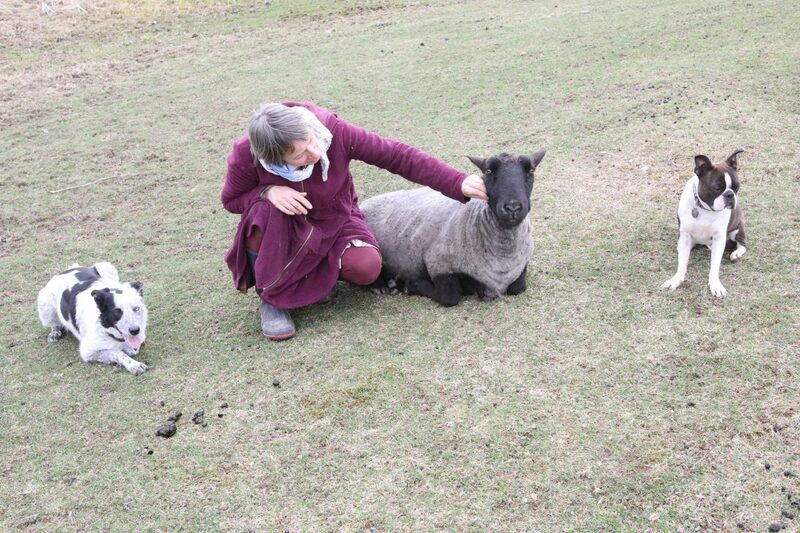 The sheep pay absolutely no attention to Fate, she can lie down right next to them and they won’t move. Bud came over to hang out, and the usually restless dog – he is rarely still outside – came over and sat down also. It was a nice scene for the Peaceable Kingdom we hope to be, and Bud is a disruptor, not usually a peacemaker. The spirit touched him this afternoon, he seemed happy to hang out with this crowd, one more image I did not expect to see today or any other day. It is a Peaceable Kingdom, after all. That’s the thing about life, if you let it, it will provide for you.